"Stars still glimmered palely in the western sky, but long pink streamers stretched along the eastern horizon, and against them the dragon banner of Nemedia flung out its billowing silken folds." 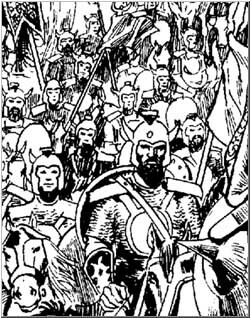 -- Robert E. Howard: "The Hour of the Dragon"
Among the Hyborian kingdoms, Nemedia is second only to Aquilonia, chafing that they are in the shadow of that rival nation. Despite ancient enmity and sporadic wars, the two nations remain locked in a diplomatic and military stalemate. Nemedian civilization is of great antiquity and sophistication. She is well situated geographically to fend off invasion, making her territory secure. Possibly the first Hyborian nation, Nemedia nurtures a tradition of intellectual inquisitiveness and scholarship. The greatest historians and philosophers of the west hail from Nemedia. The liberal atmosphere engendered by academic inquiry also accounts for Nemedia's tolerance of a broad range of religious sects outside the state-endorsed worship of Mitra. All citizens must plege allegiance to the king and are subject equally to the country's code of laws. These laws are administered by Inquisitorial Councils and Courts of Justice, which, to their credit, exonerate the innocent as often as they convict the guilty. Debtors are dealt with harshly, branded on the shoulders and sold as slaves. But slaves are well protected by law. Capital of Nemedia is Belverus, a beautiful city surrounded by rich croplands and orchards. Nemedia has long been Aquilonia's primary rival. Many of Nemedia's political efforts are directed toward demonstrating that Nemedia is more important than Aquilonia. However, despite Nemedia's cultural depth and intellectual freedom, the land simply does not have the raw materials which Aquilonia can provide. This continued rivalry has left the two kingdoms stalemated. Nemedia maintains the feudal hierarchy more strictly than in other Hyborian nations. All citizens have a place in the feudal hierarchy; they must swear allegiance to their overlord, and they hold specific obligations and rights under Nemedia's detailed feudal code. Fiefs and noble offices are passed from father to eldest son, on the basis of blood ties alone. Should no son be available to take the throne, complex rules of consanguinity are invoked to determine the proper heir. Noble birth is also a prerequisite for many positions of state. Only those with noble lineage are permitted to hold high ranks in the army, to serve on the Courts of Justice, or to head an Inquisitional Council. Only in the field of scholarship are bloodlines ignored, although a noble's sponsorship is required to get any scholarly grant from the Dragon Throne. Nemedia is a society of inquisitiveness and scientific learning. The greatest scholars of the West are employed by the Dragon Throne to produce theological, scientific and historical works. Included in these are the Nemedian Chronicles, a running historical record produced by the Court Historian of Belverus. The Chronicles are startling in their lack of bias, and it is to the Nemedian Chronicles that we owe our knowledge of the Hyborian Age. Slavery, on the other hand, is more liberal than in most Hyborian nations. The law protects slaves from excessive cruelty by their masters, and permits the children of a slave and a free person to remain free. Slaves, even debt-slaves, may be released by their masters, although many would refuse such an offer. In Nemedia, many would rather be well-fed slaves than starving freemen. Nemedia is the most liberal of the Hyborian kingdoms when it comes to religion. In addition to Mitra worship, which i5 nominally the state religion, Nemedia supports philosophical orders such as the Skeptics, as well as temples to the Shemitish deities and the mysterious cult of Ibis. This religious chaos is one of the sources of animosity between Aquilonia and Nemedia. The temple of Mitra in Aquilonia has near-total control of the religious life of Aquilonia's citizens, and over the centuries have pressured Aquilonia's kings to sue with the Dragon Throne for similar concessions in Nemedia.